This is Yolie from the DCWV Social Media Design Team with you today to share a Mother’s Day gift idea. 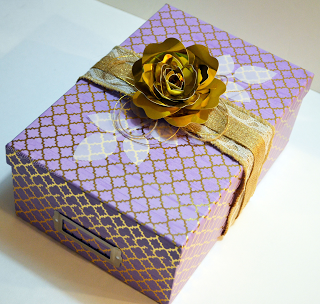 I am using DCWV’s Lavender Quarterfoil storage box as gift box. 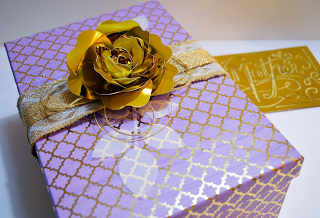 I added burlap ribbon, jute, gold cording and topped the box with a gold foil rose. I used the gold foil paper from the The Cardstock Stack to cut the rose on my Cricut. This stack has double sided glitter, foil, and cardstock. 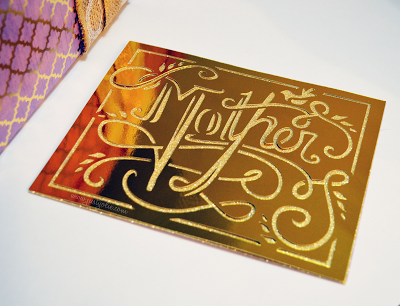 The foil is simply gorgeous with an almost mirror-like finish. I used the vellum paper from the 6″x6″ Foiled Vellum Stack to cut the leaves. I love the soft subtle look of vellum leaves. The card measures 5″x7″ and I used the same Gold Foil paper and adhered to gold glitter paper from the 12″x12″ Glitzy Glitter Stack. The card design is a Cricut Design Space file, Mother Fancy Bird. The gold foil is absolutely gorgeous in person. 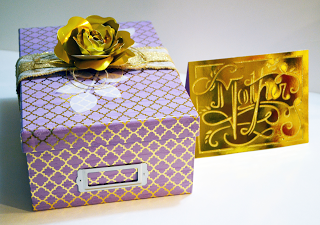 Here’s another view of the gift box and card together. I hope my Mother-in-law will like her gift! Thanks for visiting today and Happy Mother’s Day!